This part will explain how buyers formed a community and tackle the issue. When meeting in groups with the local management of the builder did not help, the residents decided to print banners and sit in protest at their office in June-July 2013. Meanwhile, Nayak suggested that all the buyers get together, form a registered association and fight out the builder legally. As a prelude, he suggested that all the buyers (about 150) shall send legal notices to the builder’s head office. Buyers Welfare Association (BWA) was registered soon after, under Karnataka Apartment Owners’ Act, in 2013. Now it would be a concerted effort. The first thing that BWA did, immediately after formation, was to send a legal notice on behalf of all buyers. Discussions were initiated with lawyers on how to file a consumer complaint against the errant builder at the Karnataka State Consumer Forum. However, the lawyer advised against it and suggested filing the case after getting possession. Hence BWA decided not to file the case at that time. However, Sundar and Nayak sought to form a group of interested individuals who were willing to immediately file a consumer case. The response was awesome! Around 150 people showed interest. However, in the end only 10 people actually went ahead and filed the case in 2014. But that was a good number to start. Meanwhile, another protest by residents was planned in August 2014 on a huge scale, with tents, banners et al. This was the most successful of all initiatives which directly resulted in the builder handing over 10% of the apartments to the customers, within two months of the protest. It was a great moral victory for the buyers. Here, all the residents got together and attended the protest in huge numbers. Those who could not make it personally, due to location and other constraints, helped in other ways such as funds, social media campaigns, protests at their own locations etc. Sundar, just with his family of three, would coordinate and protest on the same day, at his location in New Delhi, in front of the builder’s head office. It was so well-coordinated that media picked it up immediately and the builder was forced to listen to Sundar and promise resolution at the earliest, which still remains a promise! BWA, on its part, started connecting with other RWA office bearers, became a member of Federation of Apartment Owners Association (FAOA), an umbrella group covering many RWAs in Delhi region, most of them aggrieved customers of the same builder, who had already filed numerous cases against the builder. The three protagonists of this story then began studying and researching the case in their own small capacities, trying to identify alternate grievance redressal mechanisms under the ambit of law. One of them had filed a case in May 2015, with Institute of Chartered Accountants of India (ICAI) against the auditing firm that was hands-in-glove with the builder. They used to extort money after showing their CA certificate to buyers and coaxing them to heed to all demands by the developer. As a result, disciplinary action was initiated against the auditing firm. Because of the ongoing disciplinary action, the auditor is not signing anymore certificates for this builder. Buyers also approached Security Exchange Board of India (SEBI) along with ample evidence of malpractices by the builder, to fool buyers and investors, by falsely inflating profits. SEBI has set up a committee and is investigating this under the stringent “Financial Irregularities” clause, which is highly classified and the results of which may not be made public (however, suitable action would definitely be taken at the end of the enquiry). A case has been filed with MCA (Ministry of Corporate Affairs) which may result in cancellation of the builder’s license altogether. A case has been filed with ‘Registrar of Societies’ against the fraudulent association formed and imposed on the buyers and the buyers being forced to transfer money to this third party in the name of various charges. Another case was filed with Central Commissioner of taxes against the various taxes being demanded by builder whereas none of it has been paid to the government. In the month of April 2015, BWA initiated another huge protest (indefinite till the demands were met) against the builder. One of the buyers sat on an indefinite hunger strike and had to be hospitalised by the end of the 6th day due to his failing health. There was a car rally to Freedom Park at Bengaluru followed by a march to the Chief Minister’s office to hand over the petitions sent by buyers from across the globe. This rally attracted huge media attention and was joined by RWA members from a few other societies. Once the National Media picked it up, the developer’s headquarters in Delhi had to sit up and take notice! A twitter campaign (headed by fellow buyer Manish) was highly successful and managed to get the attention from the PMO and Union Law Minister, DV Sadananda Gowda, who later met a delegation of buyers and directed the officials of the developer firm and municipal agencies such as BBMP to expedite all processes and ensure earliest possession to aggrieved buyers. The twitter campaign made a big dent against the developer’s reputation across the globe. The Station House Officer (SHO) of the concerned police station was forced to accept our complaint and give acknowledgement. However, he did not file an FIR, despite their own law officer advising them to do so! Petitions were sent to the Prime Minister’s Office (PMO) and the Prime Minister was kept abreast of the happenings, by the personal efforts of fellow buyer Palak and Nayak. The chief of the real estate company was forced to fly in to Bangalore, meet the residents and promised speedy possession of flats if the protest was stopped. Buyers believed this and stopped the protest. Soon after the protests, it was decided that a consumer case be filed against the developer at the National Forum in New Delhi. A whopping 350 people have become party to this case and the whole Real Estate Industry, the Political Establishment, the Judiciary as well as countless distressed buyers across the country are keenly following this case. This case has set a benchmark for everyone to follow in order to nail down such corporates that dupe buyers. Buyers have become more and more aware, vigilant, informed and forthcoming in their fights against their respective builders. The case at National Consumer Disputes Redressal Commission (NCDRC) is the largest in the history of India where 350 people have filed against a single entity. A whopping compensation of Rs 900 crores is being demanded from the developer, with residents having ample amount of evidence to indict the developer. As the CA firm against whom disciplinary action was initiated doesn’t sign any more certificates for the developer, the developer managed to arrange for a CA in Bengaluru. But the new CA, on knowing the history, chose to retract. With no other option left, the developer is using the services of a ‘Chartered Engineer’ nowadays to do the work and issue certificates to buyers. This has been challenged at the Institute of Engineers. Soon the developer might lose the chartered engineer as well! What next for the buyers? While many of us are still waiting for our dream house, there is a ray of hope after the Real Estate Regulatory Authority (RERA) bill being passed by the Parliament. This bill is a harbinger of hope for all the clueless and helpless apartment buyers of India who fall for this huge scam, just because they decide to entrust their life’s savings onto a big brand builder in order to own a dream house of their own, perhaps, some day! Behind the three ordinary citizens who are fighting this case, there are countless silent tears, infinite restless thoughts of hopelessness and desperation about losing one’s life’s savings and not being able to do anything about it, a rotten system forcing common men to bear the brunt of home loans and house rents at the same time, some retired citizens who have nothing left other than this hope for their own house, during their lifetime. The saddest part was when we realised one of our fellow buyers, a senior citizen who was a retired defense employee, expired recently while still awaiting possession of his flat. Prayers and blessing from these people help the trio to keep going on from strength to strength in their fight against the builder. I am sure there will be many more musketeers waiting in the shadows to take up the fight. Now is the time for them to come out and show to the world – what the common man is capable of doing! However, let me assure you that despite its various shortcomings, the Indian law is strong enough to nab criminal builders. It’s high time we stand up, get united and hit back hard – where it hurts them most! Note: Name of the builder has been withheld in the story because the legal proceedings are in progress. Citizen Matters is in possession of the related documents for this story and has got legal inputs before publishing the story. Here’s how a team of citizens went about clearing the storm water drain in their layout – a seemingly impossible work that only municipal administration is supposed to do. Can I have the contact number of anyone of you three leaders, a large number of families r facing the same money minting tactics by a builder in Bangalore since 3 yrs. Need your help. the name of the builder should be published otherwise many prospective buyers would be duped. 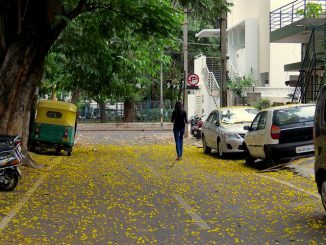 is this the Westend issue thats widely known in Bangalore. If it is then I am sorry for the buyers at that apartment. I think there was another famous builder with such con tactics HOH that is also widely read and heard. Only in India where you can be screwed forever even when the law exists. Never go for pre launch offers.